Background: Survivin, smallest Inhibitor of Apoptosis Protein (IAP) mediates apoptosis pathway and cell cycle is tumor specific and therapeutic target for cancer research. Breast cancer is a dreadful disease with greater mortality rate, commonly in women globally. Aim: This study was undertaken to investigate the effect of indigenous Plant drugs by in-silico determination of antagonist for Survivin protein that was up regulated in breast cancer. 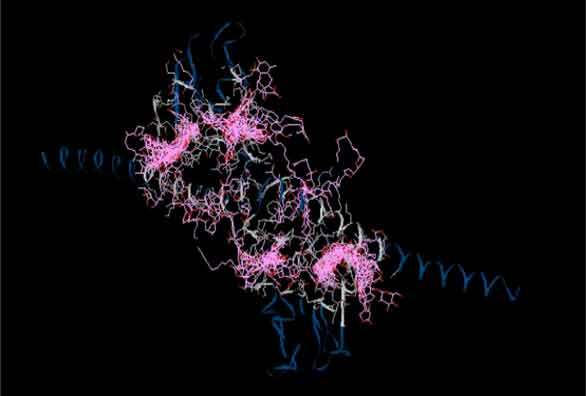 Materials and Methods: The 3D structure of Survivin protein was retrieved from PDB (Protein Data Bank). Plant compounds were retrieved from NPACT (Naturally occurring Plant based Anti-Cancerous Target) database and converted into 3D- PDB format using Open babel software. Based on the active sites we have screened the essential plant compound as an effective binder against modelled protein using iGEMDock 2.1. Results and conclusion: The lead compound of plant as well as plant protein molecule would be scaled out on the basis of binding efficiency. Remangilones A showed greater interaction effect with Total energy (-121.465kcal mol-1). However, further in-vivo investigation is essential for the confirmation of drug efficacy and bio-compatibility. Keywords: Breast cancer, IGEMDOCK, remangilones A, survivin. Keywords:Breast cancer, IGEMDOCK, remangilones A, survivin. Abstract:Background: Survivin, smallest Inhibitor of Apoptosis Protein (IAP) mediates apoptosis pathway and cell cycle is tumor specific and therapeutic target for cancer research. Breast cancer is a dreadful disease with greater mortality rate, commonly in women globally.